Thus far, 2014 has not been kind to the Buffalo Bills' family. A few weeks ago, longtime owner Ralph Wilson passed away at the age of 95, leaving the future of the team in the Buffalo area, at the very least, questionable to the extent that rumors of Donald Trump stepping in as the owner were viewed as a good thing by many. Prior to that, it was the tragic news that Bills legend Jim Kelly's cancer had returned. He is currently in Buffalo undergoing treatments. All of this to go along with the general malaise of merely being the Buffalo Bills, y'know? So given the very human toll that's piled up over the previous month, perhaps the occurrences of this past week don't really register emotionally for the Bills themselves, but for any other NFL team (ahem, Texans) this would be enough action for an entire year. Let's start with a lawsuit settled, shall we? In the sports world, for many people, signing up for text flash message services is still a thing. The Buffalo Bills have agreed to pay up to $3 million - largely in the form of debit cards redeemable only at the team store - to settle a class-action lawsuit that accused the team of sending too many alerts to fans who signed up for a text-messaging service. But in a settlement filed last week in federal court in Tampa, Fla., the Bills agreed to provide up to $2.5 million in debit cards to people who had signed up for the text service, along with $562,500 to Wojcik's lawyers and $5,000 in cash to Wojcik as class representative. Language on the website promised fans who enrolled in the messaging service would receive three to five messages per week for 12 months, but according to Wojcik, he received six messages during his second week in the program and seven messages during a later one-week period. The horror! Who could blame Wojcik? Who wants to hear about the Bills anymore than is absolutely necessary? Moving from one courtroom to the next one, the Bills were then taken to task by their cheerleading squad, who maintained that Buffalo has long been operating a low cut, cleavage laden sweat shop. BUFFALO, N.Y. -- Five former Bills cheerleaders on Tuesday sued the team over a pay system they say had them working hundreds of hours for free at games and at mandatory public appearances where they sometimes were subjected to groping and sexual comments, and one said they had to take a jiggle test so their boss could see how firm their bodies were. The Bills' cheerleaders aren't paid for games or practices and have to make 20 to 35 appearances, most of which are unpaid, at community and charity events each season, the lawsuit said. On top of that, they have to pay $650 for their uniforms and are not reimbursed for travel or other expenses, the cheerleaders said. The civil action, which seeks unspecified back pay and legal fees, names Stejon Productions Corp., which assumed management of the Jills in 2011, along with former manager Citadel Communications Co., and the team. The Buffalo Bills published an article which reported head coach Doug Marrone had cancer. 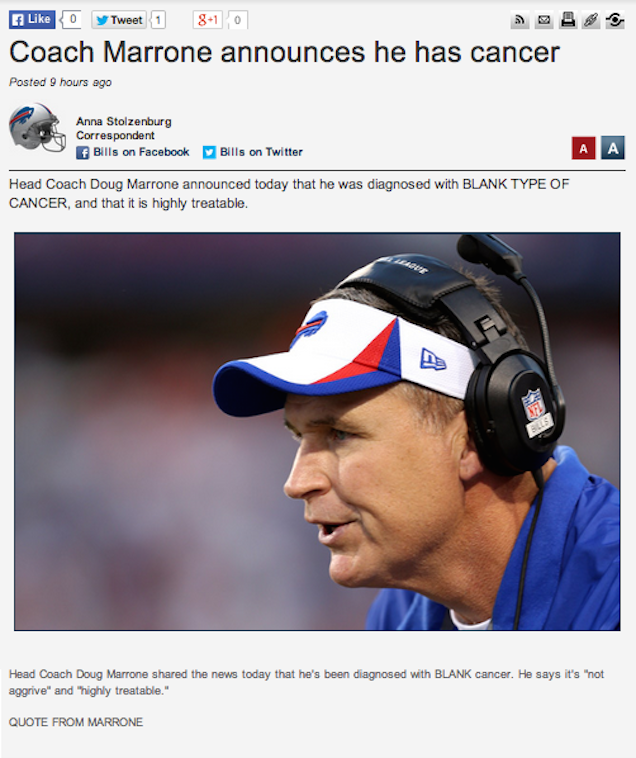 Though Marrone may have planned to announce his cancer, the story looks to be prematurely published, since "BLANK TYPE OF CANCER" is still in the dek. Nick St. Denis seems to be the first to have noticed the unfinished article from nine hours ago. The text of the article is two sentences and placeholder text with the intent to insert quotes from Marrone about his cancer. The story's already removed, but here's a screen cap. Word later matriculated out through more conventional channels and with actual details on the type of cancer! Bonus! #Bills Head Coach Doug Marrone says he had a cancerous mole found on his skin. It has been removed. Won't effect ability to coach team. Lawsuits, settlements, jiggle tests, and more cancer. Welcome to Buffalo!